Colour: Glossy lacquered inox with white glossy lacquer (bianco artico). Worktop: 8cm corian + inox. Sink: 2 x inox design sink V40. Plinth: Glossy white 15cm high. Composition: Tall units with island. Sizes tall units: 429.0 x 60 cm. Sizes island: 364.0 x 120 cm. Warranty: 10 years on Snaidero furniture. 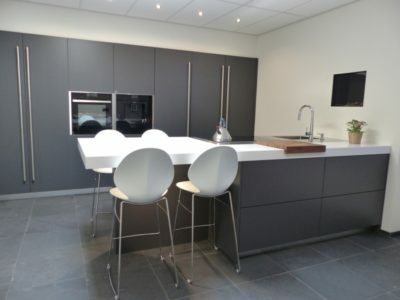 Very complete kitchen with VarioSteam Neff oven, dishwarmer and integrated coffeemachine. Hob: Neff extra wide 3xFlex induction hob T54T97N2. Oven: Neff B45VS24N0 VarioSteam with revolution handle and EasyClean. Tap: 2 x Neff Fontana 40. 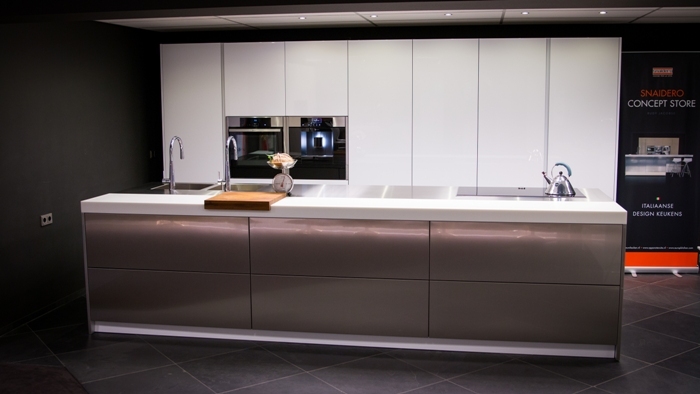 On above video you can see the S18 kitchen on display in our showroom in the Netherlands.